Every organisation is run by humans. A system of risk management that does not provide protection against risks from commonplace human behaviour and from the way that organisations are organised has a major flaw. 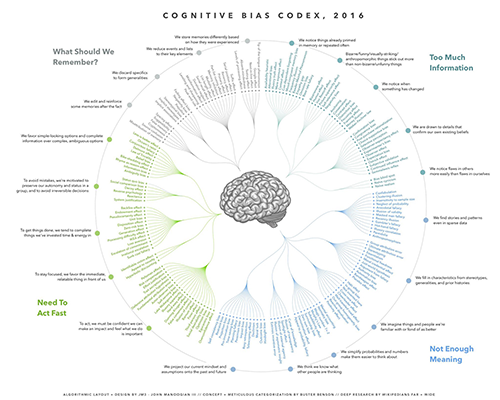 Enter heuristics, behavioural preferences and cognitive biases. We use these almost unconsciously to make decisions. Hence, they lie at the root of many behavioural and organisational risks. 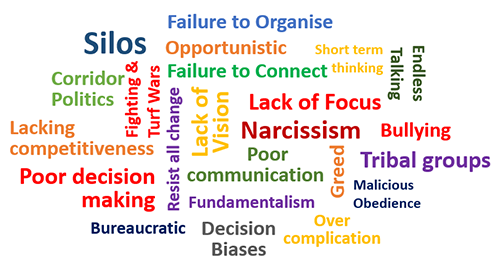 And when these and other deep seated, but unrecognised, systemic risks emerge, after what is usually a long period of incubation, they regularly lead to organisational damage. Traditional consideration of behavioural risks (Shefrin) (2015) [Behavioral Risk Management., Palgrave Macmillan] ,Meyer & Kunreuther [(2017) The Ostrich Paradox – Why we underprepare for disasters, Wharton Digital Press] focuses on cognitive biases. . These are important, but the elephant in the room is the risks created by the normal behavioural preferences of the leadership team. Differentiating between behaviours is fundamental to making sense of what goes right and wrong in leadership teams. Just like the old advertisement ‘Oils ain’t oils’, behaviours aren’t behaviours. We understand behaviours can be fundamentally different (e.g. organising, planning and creating certainty v. socialising, connecting, and caring), and that the same type of behaviour can be expressed in positive ways (producing energising effective outcomes), negative ways (undermining intended outcomes), over-the-top ways (exaggerated) or simply blindness to the type of behaviour (not on the radar). Most organisations that would endorse the idea that positive behaviours by leaders and managers is a good thing. In the execution of collaborative contracts, this approach can enhance performance and efficiency. Whilst most individuals would articulate the benefits of positive behaviours, and the benefits to morale, engagement and performance within contracts, negative behaviour(s) by managers or leadership teams can still occur and results in damage to the collaborative contract that the leadership group is entrusted to lead.